Melanie Cellier presents the second book in the Beyond the Four Kingdoms series. Princess Sophia has helped her twin sister Lily save the duchy of Marin. But now Sophie faces an even greater threat when she sets out to free the cursed kingdom of Palinar from its beastly prince. Alone, and with danger on every side, Sophie must navigate a magical castle and its even more mysterious master to discover the secret to breaking the curse. Except the more time she spends with Prince Dominic, the more she starts to question who exactly she's supposed to be saving. With time running out for the trapped inhabitants, and the reappearance of an old enemy, Sophie may have to choose between saving the kingdom and following her heart. 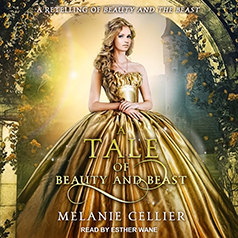 In this reimagining of the classic fairy tale, Beauty and the Beast, Beauty will have to use all of her strength and intelligence if she is to outwit her enemies, break a curse and find true love.